To show share counters with your buttons on site you need at first to set the feature to show counters. This happens inside the style settings (global for site or for each personalized settings). Learn everything about style settings and activation of share counter to selected design here. All settings related to social share counters you can find in Social Sharing -> Share Counters Setup. Counter update section holds all options about share counter update and a few for controlling the counter display. Choose how your counters will update. Real-time share counter will update on each page load and usage on production site can produce extreme load over admin-ajax WordPress component – use it with caution. We strongly recommend using updated on interval counters. They will update once on chosen interval and ensure your site will work fast and smooth (if you use cache plugin and they do not update frequently you can activate in advanced options cache compatible update mode). For most sites recommended update counter value is 3 or 6 hours. The avoid negative social proof allows if active to hide the share counter unless a specific value is set. If you wish to use it set the option to Yes and you will have the chance to setup value for total counter and/or single button counter. Speed up process of counter update – This option will activate asynchronous counter update mode which is up to 5 times faster than regular update. Option requires to have PHP 5.4 or newer. Warning! This option may not be supported on all hosts (or not active by default). If you see an issue immediately deactivate it. Force save new shares – Plugin comes with share counter protection. This protection will avoid saving share counter values if they are lower than the past update. That is made to protect the social privacy. Very rear it may be required to avoid that protection. Set the option to Yes temporary to save any of the saved share values. Client side Facebook counter update – Use client side Facebook counter update to eliminate Facebook rate policy for number of connection you can send. The client side update will ensure your counters will frequently update. Option is compatible with share recovery. It is recommended for usage on sites to ensure a proper Facebook share counter update. The option will executed the share counter update inside client browser (not on server level) – see note at the end of the article. Client side Pinterest counter update – Pinterest apply restrictions when you are using few hosts that avoid Pinterest counter extraction. In such case please activate this option to avoid missing Pinterest counters. Due to Pinterest rate limitations this option cannot work with share recovery. Share counter recovery allows you restore back shares once you make a permalink change (including installing a SSL certificate). Share recovery will show back shares only if they are present for both versions of URL (before and after change). We have a detailed article explaining work of share recovery that you can pay attention here. The single button share counter section holds additional options for individual share counters. Those options are set globally and you does not need to change them regularly unless a social API change is presented. Twitter share counter – Twitter does not have official share counter. As of this inside plugin you can choose between showing internal counter, external service counter or leave the button like the network standard – without share counter. Please be aware that if you select external service you should visit its site and complete all the requirements they have (otherwise counter value will not appear). LinkedIn share counter – LinkedIn recenly announced that they are removing share counters from their button and API. The API may still return data for your site but it is adviced to switch to internal counters. Google+ share counter – Google+ recenly announced that they are removing share counters from their button and API. When that become globally you can switch to internal counter. Deactivate counters for Mail & Print – Enable this option if you wish to deactivate internal counters for mail & print buttons. That buttons are in the list of default social networks that support counters. Deactivating them will lower down request to internal WordPress AJAX event. Fully deactivate internal share counter tracking – Even when you do not display share counters on site at this moment plugin tracks internal counter with each button click. This is made to provide a share counter value when you decide to show or use share counters. Activation of this option will completely remove the execution and work of code for all internal tracked share counters – if you have any existing internal counter values they will stop increase and for all others it will not add a value. Hint: Rember that major networks like LinkedIn and Google+ removed share counters and there is no alternative of counter value at this time rather than internal counter. Share counter format – Choose how you wish to present your share counter value – short number of full number. This option will not work if you use real time share counters – in this mode you will always see short number format. Animate Numbers – Enable this option to apply nice animation of counters on appear. The total counter section contains additional options about total counter display. Change total text – This option allows you to change text Total that appear when left/right position of total counter is selected. Append text to total counter when big number styles are active – This option allows you to add custom text below counter when big number styles are active. For example you can add text shares. 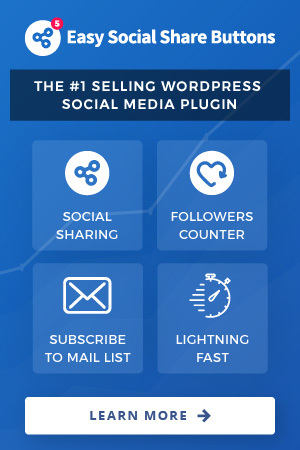 Always generate total counter based on all social networks – Enable this option if you wish to see total counter generated based on all installed in plugin social networks no matter of ones you have active. Default plugin setup is made to show total counter based on active for display social networks only and using different social networks on different locations may cause to have difference in total counter. Use this option to make it always be the same.